Southern grit meets Southern grace. 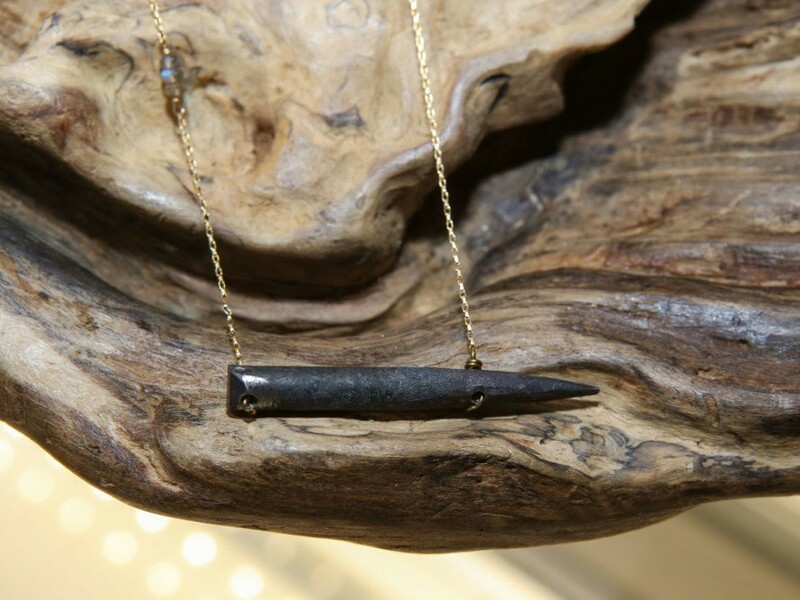 That's how New Orleans–based designer Ashley Lyons describes "Torchbearers," a line of handcrafted jewelry that features part of the tongs that fishermen use to harvest oysters from the bottom of the seabed. Each "tooth" was forged by Rodney Richards, a blacksmith from Apalachicola, a Floridian fishing village that produces about 90 percent of the oysters consumed in the Sunshine State. But both Richards's trade, which he learned from his father, and the oyster industry it supports, are in jeopardy, Lyons said. "Apalachicola’s oyster industry has all but collapsed over the last several years—brought to its knees by drought, the 2010 oil spill and a tri-state water war that is now before the Supreme Court," she wrote on Kickstarter, where she's campaigning to raise $25,000 to bring the line to market. Another is cultural preservation, since the oyster industry’s downturn has resulted in a similar decline in business for craftsmen like Richards. “The ‘Torchbearers’ collection embodies the grit and resolve of the Gulf Coast’s traditional fishing communities,” Lyons said. “By restyling their product into fashion accessories, we can give them a reason to continue plying their trade, so that they can hopefully pass it on to the next generation,” Lyons said. There’s also an environmental element. Five percent of “Torchbearers'” proceeds will benefit Apalachicola Riverkeeper, a nonprofit devoted to the preservation and protection of Apalachicola’s waterways. Lyons fashions all her jewelry in the French Quarter, where she also operates her flagship store. Pieces start from $95 for a long pendant and chain. A pledge of $2,500 or more gets you one of 10 14-karat-gold necklaces, plus tickets to Lyons’s January 7 launch party. “The ‘Torchbearers’ collection embodies the grit and resolve of the Gulf Coast’s traditional fishing communities and imagines a future in which tradition and progress coexist and support one another,” she added. Lyons says the jewelry has several purposes beyond the aesthetic. The first is awareness. "Each piece in the Torchbearers Collection is meant to start a conversation," she said. "By getting more people talking about oystering, we hope to raise the profile of the Gulf Coast’s traditional fishing communities and the people whose livelihoods depend on them." Another is cultural preservation, since the oyster industry's downturn has resulted in a similar decline in business for craftsmen like Richards. "By restyling their product into fashion accessories, we can give them a reason to continue plying their trade, so that they can hopefully pass it on to the next generation," Lyons said. There's also an environmental element. Five percent of "Torchbearers'" proceeds will benefit Apalachicola Riverkeeper, a nonprofit devoted to the preservation and protection of Apalachicola's waterways. Pieces start from $95 for a long pendant and chain. A pledge of $2,500 or more gets you one of 10 14-karat-gold necklaces, plus tickets to Lyons's January 7 launch party.